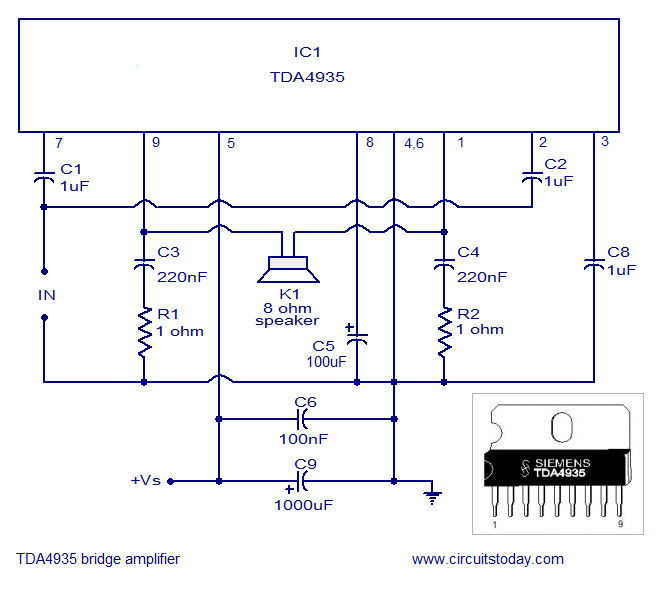 The circuit given below is a bridge audio amplifier circuit using ICÂ TDA4935. TDA4935 is 2x15W high quality audio amplifier IC from Siemens. The IC can be used in stereo mode or bridge mode. In stereo mode it can deliver 15W per channel and in bridge mode it can deliver 30W into a 8 ohm load at 30V supply. TDA4935 requires very few external components and has a wide power supply voltage range. The IC operates in class B mode and has built-in circuitry for over temperature protection and overload protection. TDA 4935 must be fitted with a proper heat sink. The supply voltage can be anything between 8 to 30V DC. Capacitors C1, C2, C8 are polyester capacitors. Capacitors C3, C4 and C6 are ceramic capacitors while C5 and C9 are electrolytic.